When I try to express to people just how much I love dates, here’s what I say: I might even love them more than chocolate. That’s certainly a strong statement coming from me. An apple a day keeps the doctor away (so they say), a square (or two) of dark chocolate keeps it balanced, and 5 dates a day… keeps me happy. 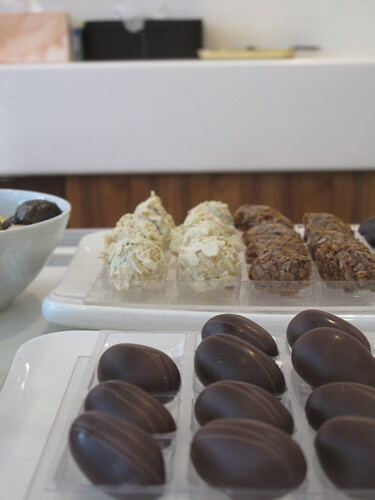 When I knew I was heading to London for Food Blogger Connect in early June, I did all of my characteristically sweet research, compiling lists of addresses to find the city’s best and most interesting chocolate, cupcakes, ice cream and artisanal sweets. Above all of those was one word, in bold, underlined, with stars around it and arrows pointing to it. This was one address I was not going to miss while in the UK (thanks to Romy‘s sweet London roundup). 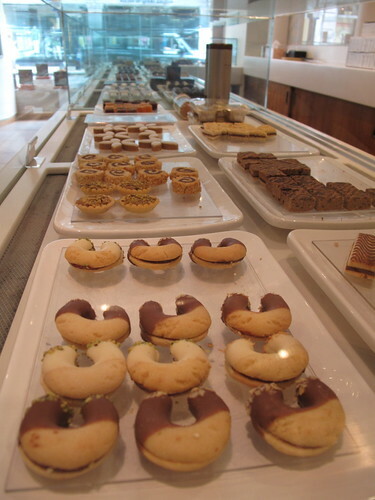 And so, in addition to the chocolate shopping I did, I made sure to go to Bateel. Bateel ? Picture a bright, clean minimalistic shop, narrow and long, its impeccable cases filled with items neatly lined up. A chocolate shop ? Nope. What if I told you it was a date shop ? “The world’s only gourmet date experience.” You can see Alfred Hunter below right, preparing a box of these delicate fruits for me with utmost care, contributing to this unique and truly delicious experience. I can’t say for sure when I tasted my very first date; I suppose I didn’t have that one powerful moment of enlightenment. As far I can remember, I have loved dates… There were my weekly visits to the markets when living in Paris, to Whole Foods when in Boston and to Kalustyan’s when in New York City, always searching for the big red box (Medjool dates from California) or other varieties from Israel, Jordan and Tunisia. 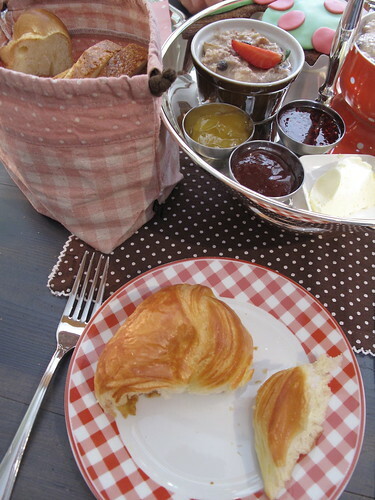 My oldest memory of dates is perhaps in Montpellier (France), where I can picture myself sitting in a salon de thé with Françoise Pouget, olive oil expert, hearing about her latest culinary adventures — my teapot remained full, but the bowl of dates served with it quickly emptied. I remember calling Kadouri & Sons in New York City’s Lower East Side when I was at Duke University, letting them know I couldn’t find dates as good as theirs. Thus began the shipments of dates from Hester Street south to North Carolina. 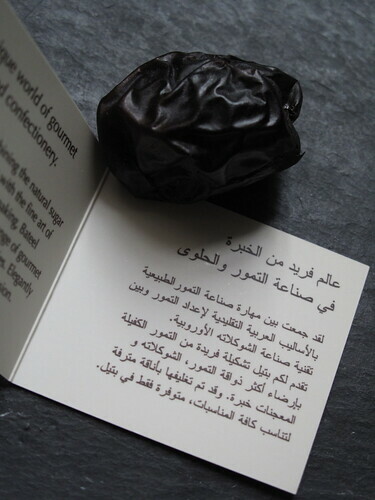 There was also the 5 kilogram box of small, dark Zagora dates I schlepped for a month when backpacking around Morocco (part of it went into granola I made for Dorie Greenspan). 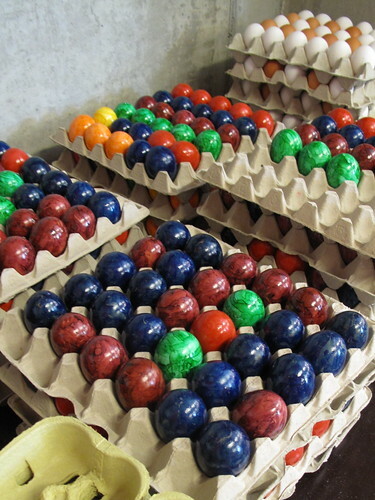 And of course my French mother-in-law’s colorfully stuffed dates every year at Christmas time. And now, this education on Saudi dates will too remain imbedded in my mind. 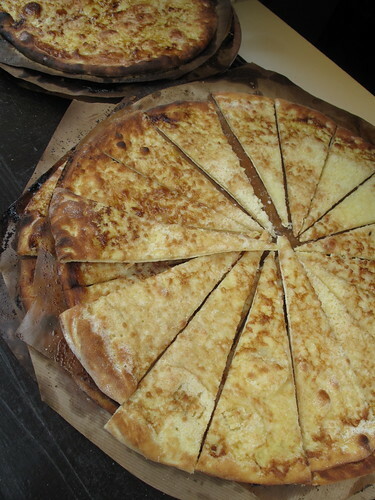 My favorite: the Barhi. 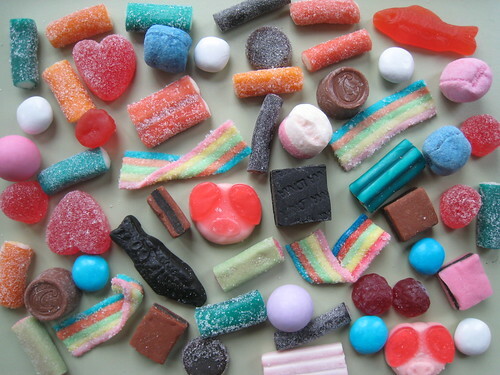 Perhaps it is no coincidence that it is the sweetest and stickiest of the bunch. 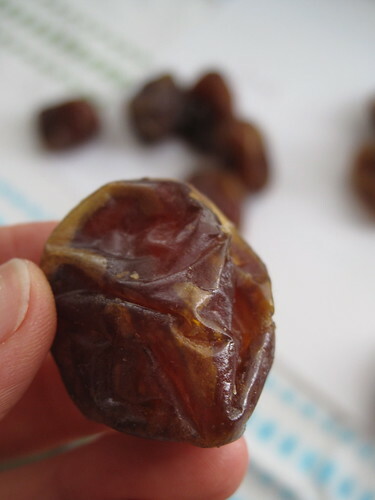 Truly a super sweet date, small, round and squishy if you try to pull apart the flesh to remove the pit. I first discovered this date at New York City’s Fairway Market many years ago; New Yorkers will have to let me know if they still carry them. 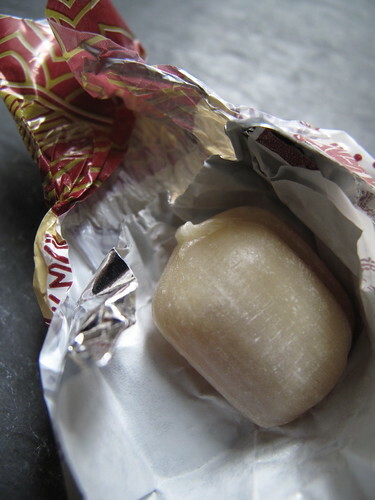 You can just pop these in your mouth like candy. My next two favorites from my Bateel selection were the Khola and Sokari. 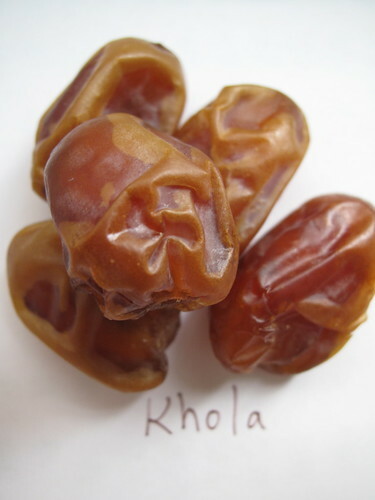 Khola dates are a golden brown, also very soft and sweet, their skin a bit loose over the flesh, which has a definite toffee flavor to it, almost syrupy. Delicate but not sticky like the Barhi, they are often paired with coffee (I’m not a coffee drinker, so I’ll just try them with coffee ice cream). 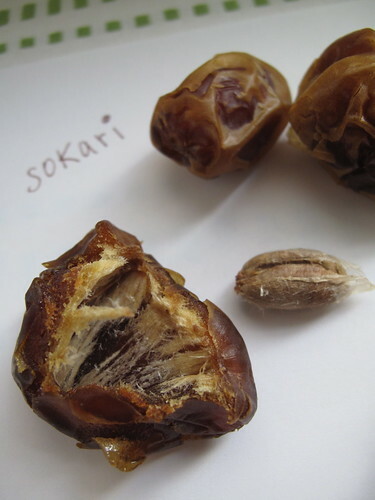 The Sokari is firm and chewy, with a slightly caramel flavor similar to honeycomb. This is actually Alfred’s favorite date (and apparently quite popular among Arabs), which he recommends soaking in milk to soften. I didn’t find them too hard at all, and liked the difference in texture – a bit harder with its recognizably creased skin. 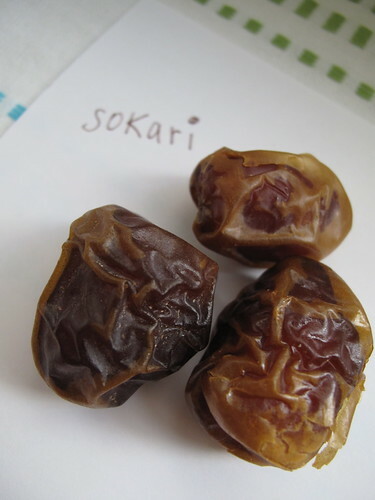 Sokari dates are also known as Royal Dates. 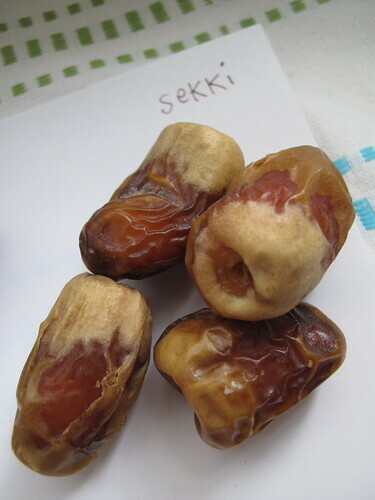 Alfred also introduced me to the Sekki date, which has an amazing mix of textures and flavors and a very unique appearance. 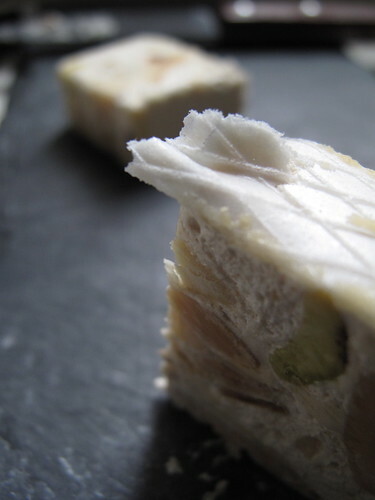 On one end, it is beige, hard, almost crunchy and quite sweet; the other side is dark, soft and midly sweet. Next to the Sekki below right is the Khidri, known for its complex flavor and an almost smoky aftertaste. I liked this date for its texture, soft and chewy. 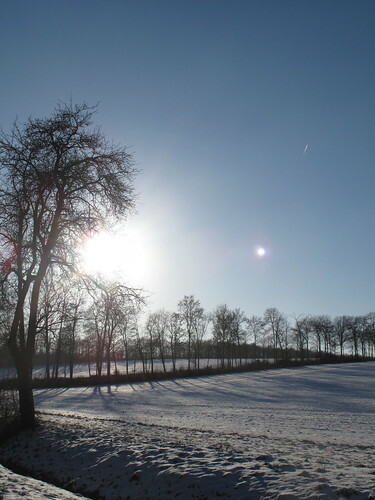 Alfred recommended the Agwa date, known to Muslims as the Holy Date. With almost black skin and a distinct flavor (not nearly as sweet as the others), it reminded me of a cross between a raisin and a prune. There is certainly a date for every palate, and Bateel has over 20 varieties, coming from their 75,000 palm trees on plantations in Saudi Arabia. 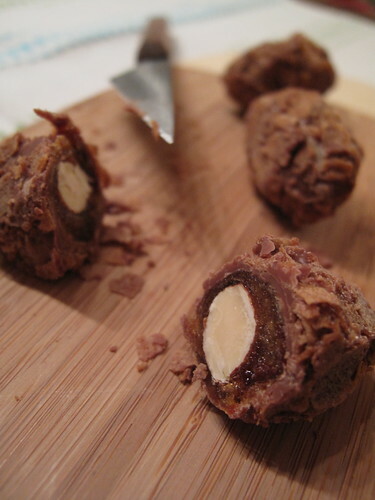 They also have dates stuffed with lemon peel, orange peel, pecans or almonds. And then there are the chocolate dipped dates, which of course got my attention. 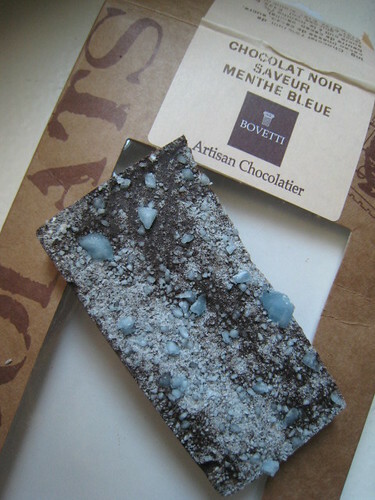 A typical snack of mine is to replace the pit of a Medjool date with a small square of dark chocolate and top it with sea salt (fleur de sel or Maldon). Bateel’s confections were more complex, and I of course tried a few, including the date stuffed with a roasted almond, coated in chocolate and rolled in crispy feuilletine flakes (below, middle right). Their date chocolates menu is worth a look, as I have never seen anything quite like it. 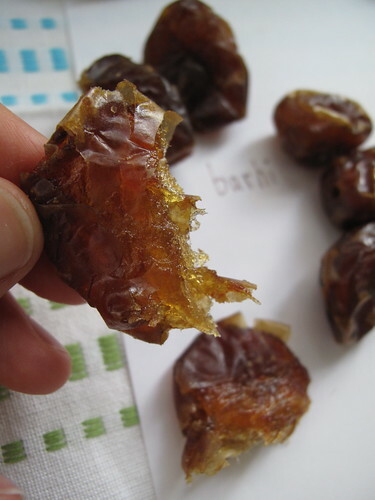 That said, with dates of such a high quality and so delicious on their own, I would rather stick to the pure, fresh dates themselves. And I still wonder why I only brought back one (even if rather large) box to Zürich. But wait, there’s more ! Date tapenade, bars, cookies, jams and mustard too. A warning on the latter: date mustard is either considered a liquid or a weapon, and will be confiscated from your carry-on luggage, as Jamie of Life’s a Feast can unfortunately confirm. 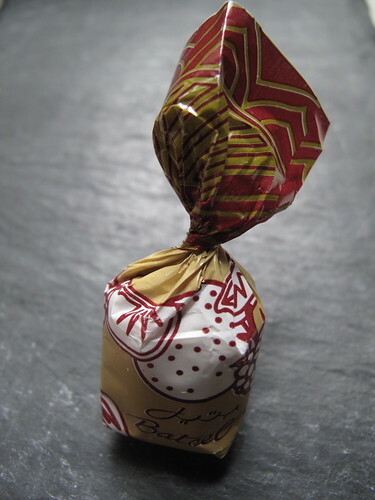 Then there were date bonbons (hard candies) and other confections (like calissons from Aix-en-Provence) and nougat, a favorite of mine. 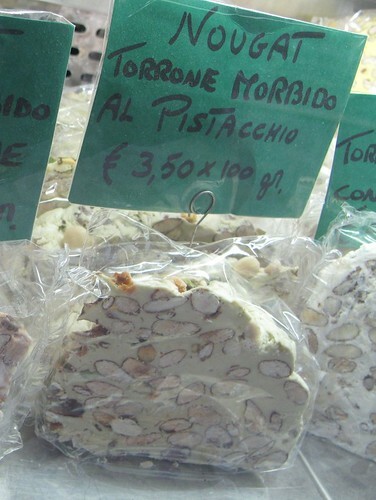 Made with lavender honey from Provence, almonds, pistachios and of course dates, the nougat was excellent, soft and chewy, if a tad sticky. 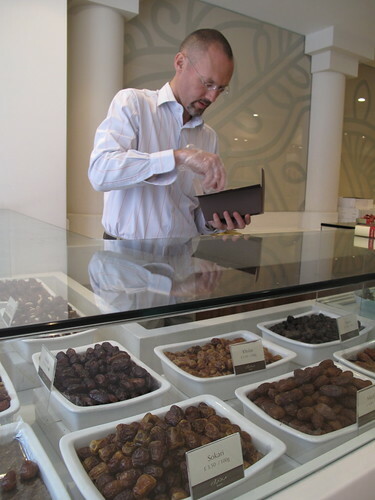 One last word, if you have a chance to visit the Bateel shop in London or one of its many locations in the Middle East (they clearly need more in Europe), be sure to ask about their Rhutab dates. These are picked when semi-ripe and frozen right away. A whole other taste sensation, and truly divine. 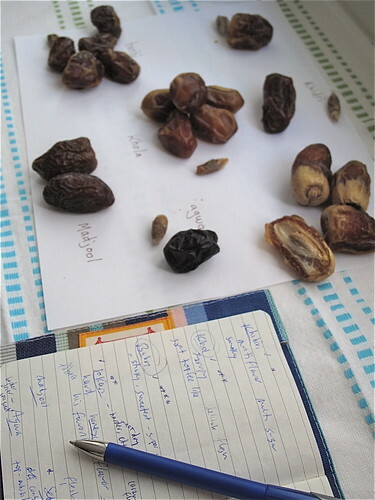 Next time I’m in London, you’ll know where to find me… trying all the other date varieties at Bateel, putting together the next series of tasting notes for you ! Have you ever had fresh dates before ? From where ? What is your favorite kind ? 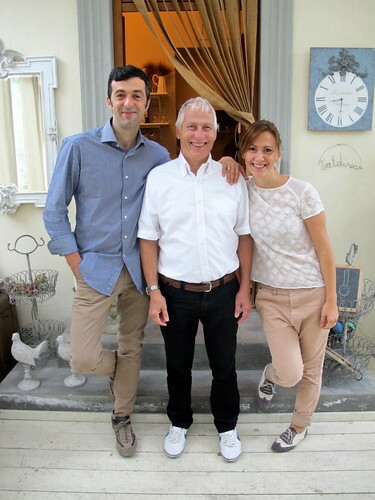 ** The shop was originally at 138 New Bond Street when I wrote about it above. 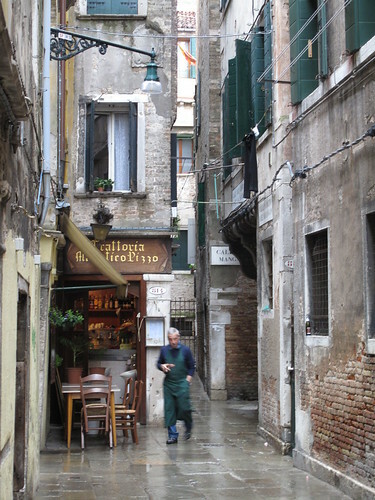 It moved to the current location in the spring of 2011 and is now a boutique and café. Bateel products can also be found at Harrods in Knightsbridge. 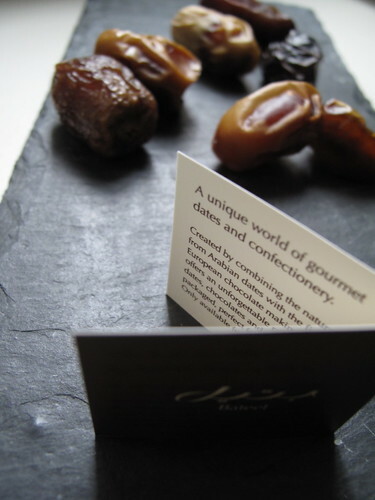 Anne, sate shop, date shop, I knew what you meant 🙂 And yes, if you love dates too, then you must go to Bateel and let me know what you think. Dates stuffed with marzipan are so good as you said. Yum. And you bet you recognize that dish towel, from your home to mine. Thank you Food Blogger Connect prop swap !! KugelDad, ha. ha. 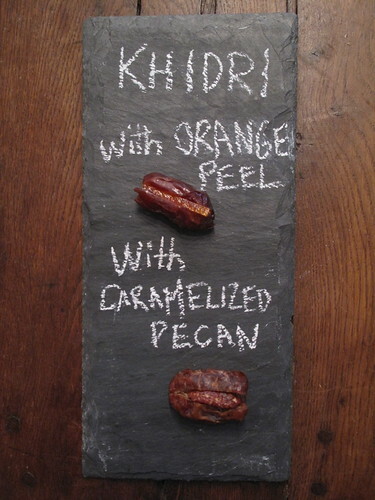 And yes, now everyone knows it, you continue to *try* to hate dates (because it’s fruit ?! ), and I am simply getting in your way. 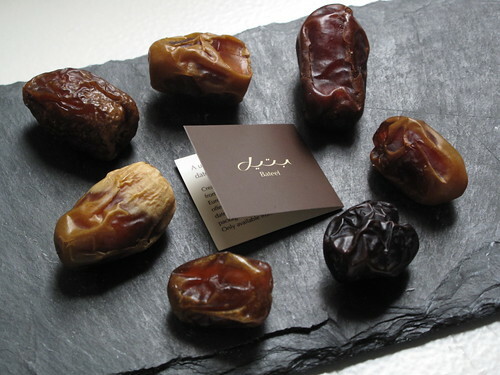 You’ll see, one day… you’ll love dates too ! 🙂 Oh, and I love reading all the comments here even more. OMG you just said everything that I feel about eating dates! 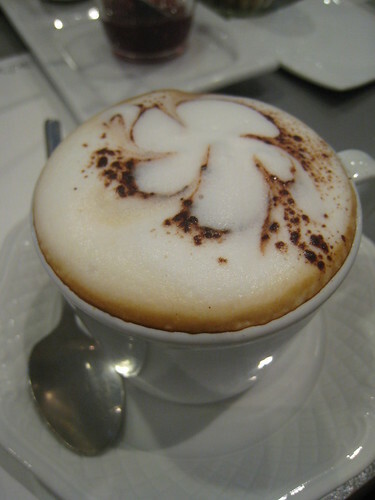 It s amazing the flavor. I love Bateel. It’s one of the first places I like to visit when I am in Dubai. Dates are a passion for me too and lucky for me it is a passion I share alone in my house so all the boxes I buy are truly for me and myself! Kerrin this was a grand post – thanks for taking us through the several different varieties! Would it surprise you that my fave is also the bahri? Second however comes the madjool! Oh Kerrin this looks like an amazing foodie experience. 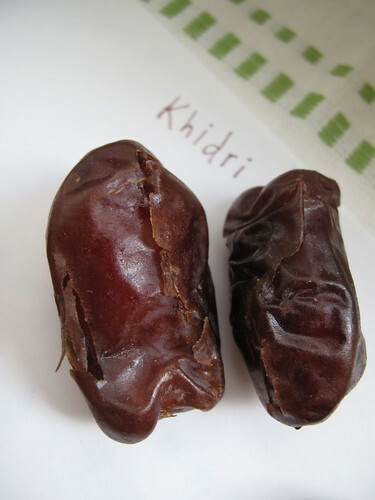 I buy dates by the kilo and it take me no time at all to eat though them. I love sitting by myself with a good book and savouring a delicious date (the way some might savour a glass of wine). Dourada, obrigada ! I never would have guessed you love dates so much too ! I wonder what kinds they have in Hawaii. Hmm, more sweet research for me to do ! 🙂 Miss you too, beijos to you and Japa ! jen, you too ?? Love it ! Samantha Angela, I am so with you. I absolutely love books – and oftentimes curl up on the couch with a book or magazine, and a plate of dates and chocolate. Mmm !! Much more fun than wine, ha ha ! Hope you can find some of these varieties here to try. Let me know if you do. What’s your favorite kind so far ? have you ever tried date molasses? in war-ridden iraq this was the only available dessert or sweet thing – a spoonful of tahini with date molasses… very addictive. it has that swwet-salty combination that i love so much. Unfortunately the shop on new bond street is shut. There isnt one at south molten at the moment. Will write to them to find out where they’ve relocated to. Thought I would let you know. Bateel update ! And good news for all of you in London – while the shop at 138 New Bond Street is in fact closed, it will be reopening at 76 New Bond Street around the middle of May 2011. Until then, Bateel products can be found at Harrods in Knightsbridge. I remember that you love dates from other things you’ve written, Kerrin, but hadn’t seen this post. I’m noting it in my travel folder for my next trip to London; thanks for the notes! Have you ever had “Immature” dates? 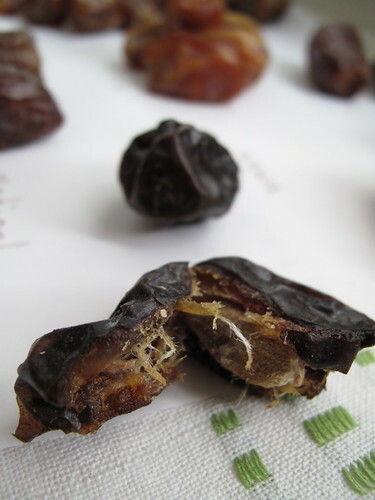 Some people think they are “fresh” dates that have not yet been dried–but I was told by a date farmer in Southern California that they are really “immature” dates. A client of mine from Iran told me about them. 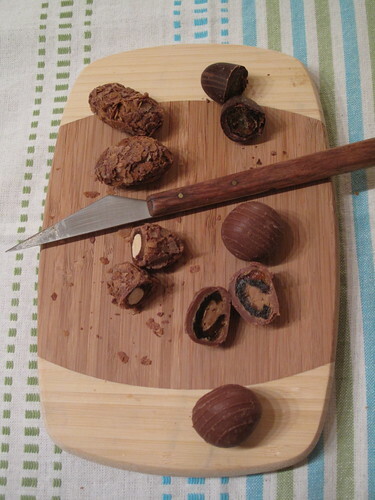 They are usually sold “on-the-stem” in clusters of about 20 dates. They start out a pale yellow color and as they “ripen” they become light brown, eventually getting darker brown–if for some reason they were not all eaten before that color change. I don’t let them get that far along! 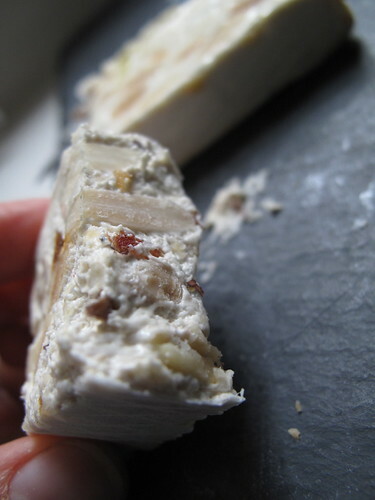 They have the most wonderful texture–kind of squidgy–soft but firm–almost gelatinous–and a much more delicate taste than a dried date–and less sweet. They are only in stores for a short time and they are very perishable. You would probably need to look in a specialty food store that has lots of exotic fruits. In the Berkeley, California area I find them at a wonderful produce market calley “Monterey Market.” I suspect the season for them is late spring or early summer. 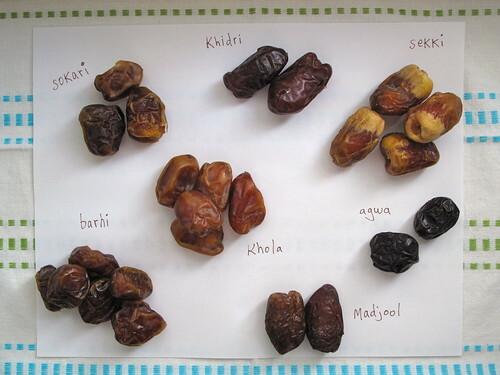 Ann the “immature” dates that you mentioned are known as “Balah”, which basically is the first stage of a date (Balah> Rhutab> Tamar). I tried the Balah once during Ramadan at one of Bateel’s boutiques in Dubai. Quite delicious, almost an apple like texture. Ramin, thank you so much for teaching me the name “Balah”–now I will know what to ask for when I am looking for them! Apple texture is a good comparison for them and as they ripen/soften, maybe ripe pear texture then, too. Thank you! nancyo, I suppose I have mentioned that I love dates a few other times than here. 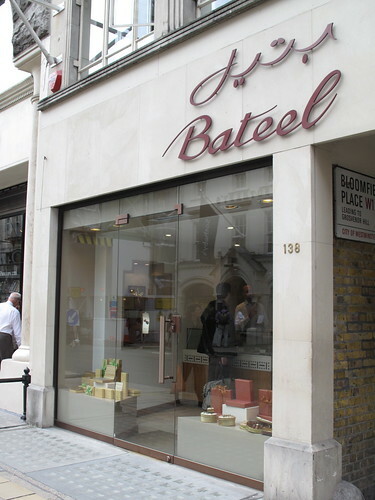 😉 Have you had a chance to visit the Bateel store in London since your comment above ? Ann, have I ever had immature dates ? Hmm, I don’t think so. At the Oerlikon market here, I have seen yellow dates sold on the branch that ripen just as you described. But I figured they were just “fresh” as opposed to immature – and they were *not* good when eaten when still yellow, as I recall. 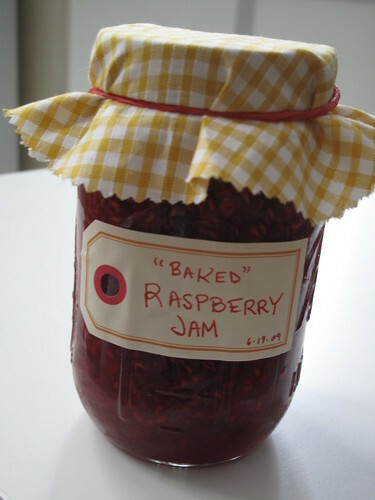 The guy at the market told me to let them ripen in the freezer for an amazing taste sensation. Try that !! 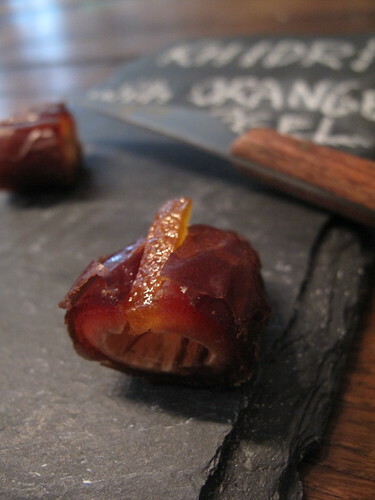 You are so lucky to live in California where Medjool dates must be everywhere ! Mmm, miss that big red box, haha ! Ramin, many thanks for clearing up the date conundrum. At first, I thought perhaps Ann was talking about Rhutab dates, but they have already turned dark. 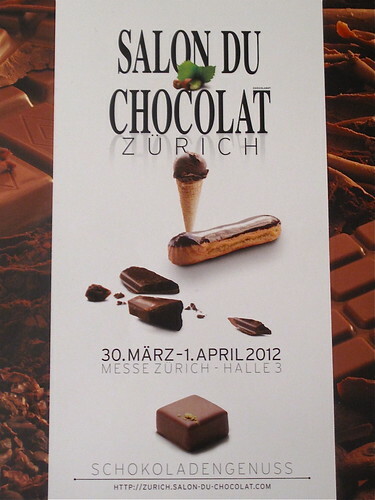 I’ll have to search for dates in the Balah stage now… only, doubt I’ll have any luck in Switzerland ! So I got a box of kholas and a box of sokari instead He came home this morning but I am still observing my fast so I can’t taste them yet hence the googling…Now your description of them is really tantalising me! Silly goose me forgot about Bateel in Dubai!